Now you can add security to ever door and window in your home and office in just seconds. 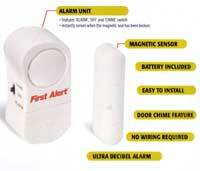 The First Alert Alerm System is designed to assist you in protecting your home and deter intruders by sounding a piercing ultra decibel alerm if your doors or windows are opened. It can also be used as friendly announcement by simply switching it ti the chime mode. The uses are endless!